Summary: Alex and Susan Wendt are the perfect couple in search of the perfect brownstone-and they find their dream house in the heart of Brooklyn Heights. Sure, the landlady is a little eccentric, and the handyman drops some cryptic remarks about the previous tenants. But the rent is so low, it's too good to pass up! Big mistake: Susan soon discovers that the brownstone is crawling with bedbugs . . . Or is it? She awakens every morning with fresh bites, but neither Alex nor their daughter Emma has a single welt. Exterminators search the property and turn up nothing. Neighbors insist the building is clean. Susan fears that she's going mad-but as the mysteries deepen, a more sinister explanation presents itself: She may literally be confronting the bedbug problem from hell. 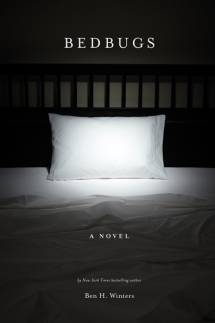 If you are a regular follower of Booking Mama, you might have be a bit surprised to find a review for BEDBUGS by Ben H. Winters. Maybe you even did a re-take! I'm certainly not a person who reads a lot of horror -- or pretty much any horror books for that matter; however, I decided to take a chance on this book. First of all, it got some pretty good reviews. Secondly, I thought I'd try to read more books that fit the Halloween season. And lastly, I thought the subject matter was pretty scary to me -- bedbugs, so I figured it might hit closer to home than some other scary stories! BEDBUGS tells the story of Alex and Susan Wench, two New Yorkers who are trying to find an ideal apartment. When they discover an amazing property in Brooklyn Heights, that they can actually afford, they jump at the chance. However, the saying, "When it's too good to be true, it probably is," should have been running through their heads. Within weeks, Susan thinks that their apartment is infested with bedbugs, but the exterminator (who is one of the best) can't find any evidence. Susan becomes obsessed with the idea of bedbugs and even begins to go crazy trying to prove the existence of bedbugs. It isn't until the very end of the novel that Susan realizes what is really going on in her apartment, and it's even worse than what she imagined! I guess I'd say that I enjoyed BEDBUGS; or at least, I appreciated the story and how it affected me. I don't know if I truly "enjoyed" the novel since it made me very uncomfortable, and I'm still not entirely sure that I'm the right audience for horror books. However, if the author's intent was to make me absolutely crazy as I read it, then I guess I'd say that this book was a success. I was almost miserable with itchiness and I felt as if there were bugs crawling all over me as I read the entire second half of the novel. I can't really say that I liked the feeling of bedbugs in my hair, but I do think my reactions says something about the author and his ability to write a convincing story. As far as the writing goes, I thought it was pretty good. I wasn't exactly expecting literature with amazingly complex characters, so I was pleasantly surprised that there was some deeper thoughts and feelings to the characters. I especially thought Susan was a fairly well-developed and I appreciated seeing her fall into a world of madness. I also thought the author did a decent job of exploring the effects of Susan's mental breakdown on her ability to be a wife and mother. While I'm not someone who watches many horror movies either (I've probably seen one or two in my entire life), I could totally see BEDBUGS as a movie. Maybe it's because having bugs that won't go away is one of my worst nightmares, but I have a feeling that since bedbugs are a very real issues for lots of people, this movie would have a pretty vast potential audience. Added to that, the characters are interesting and the ending is pretty darn suspenseful. I would love to see BEDBUGS hit the big screen, but in all honesty, I don't know if I could sit through the story with real, visual images. I probably wouldn't be able to get the story out of my mind for days, if not weeks. If you are a fan of scary books or are looking for something to get you in the mood for Halloween, then I suggest BEDBUGS. I hope it scares you as much as it scared me! Thanks to the publisher for sending a copy of this novel. While I am not much of a reader of the horror genre I will have to say the psychological thrillers are the ones that creep me out the most. Once you get something stuck in your brain it's hard to shake it out and it must be terribly frustrating to be falling into madness like the main character did. Good review! I feel like I'm a step behind you this week. This is at the top of my TBR pile. I don't read my horror, but I loved Rosemary's Baby, so I'm interested in this book. I love horror and the idea of this book already creeps me out! I have it on my wish list. Even the title just totally creeps me out. No way can I read this. I could never read this. I HAD bedbugs when I lived in New York and it was one of the most horrific experiences I've ever had. I don't wish it on anyone.